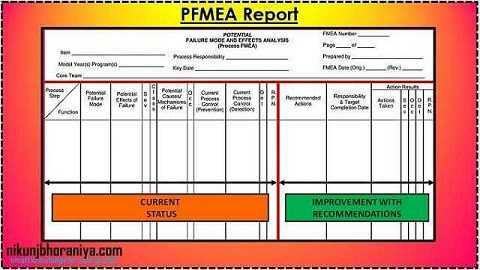 What is PFMEA or Process FMEA? 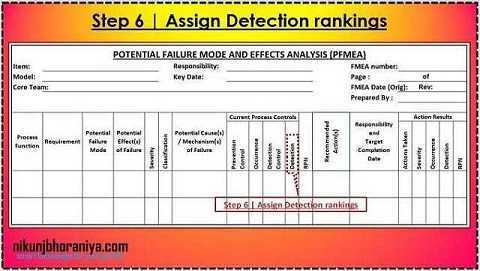 → PFMEA is a Process Failure Mode Effects Analysis. → It is a structured analytical tool used by an organization, business unit or cross-functional team to identify and evaluate the potential failures of a process. 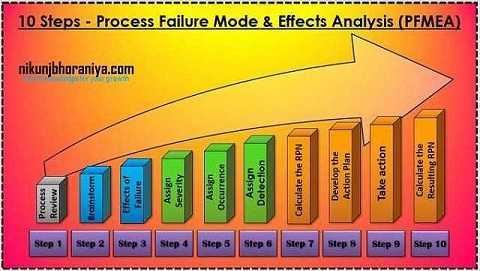 → Process Failure Mode Effects Analysis helps us to establish the impact of the failure. 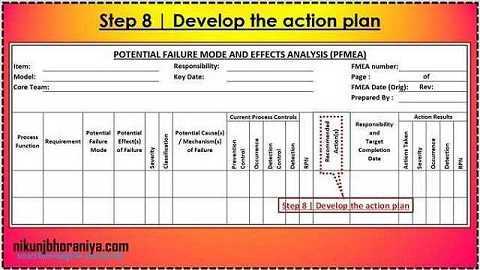 → PFMEA (Potential Failure Mode Effects Analysis) also provides a framework for identifying & prioritize the action for the items having a risk factor for minimize the risk. → It is a live document that should be updated through the process of production and maintained it through the life cycle of the product. → Use a process flowchart to identify each process component in Process Failure Mode and Effects Analysis. → List each process component in the FMEA table. → The detailed flowchart is a good starting point for reviewing the process. 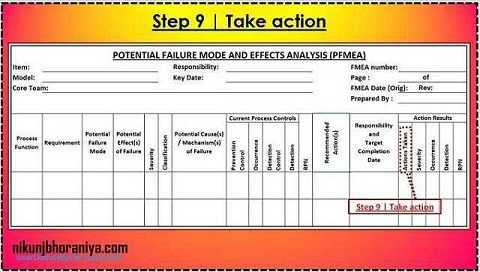 → With the process flowchart in hand, the PFMEA (Process Failure Mode and Effects Analysis) team members should familiarize themselves with the process by physically walking through the process. → This is the time to assure everyone on the team understands the basic process flow and the workings of the process components. → The first reason is reviewing the process helps us to assure that all team members are familiar with the process. → A second reason for reviewing the process is to identify each of the main components of the process. → The third reason for reviewing the process is to assure that you are studying all components of the process with the Process FMEA. → Review existing documentation and data for hints about all the possible ways that the component can fail. 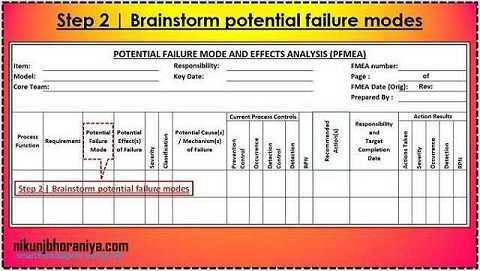 → Consider the potential failure modes for each component and its corresponding function in this step of PFMEA. → A potential failure mode represents any manner in which the component or process step could fail to perform its intended function or functions. → Using the list of components and related functions generated in Step 1, as a team, brainstorm the potential failure modes for each function. → Don’t take shortcuts here; this is the time to be thorough. → Prepare for the brainstorming session. → Before you finish the brainstorming session, review the documentation for possible causes of potential failure modes. → There may be more than one effect of failure for each failure in the 3rd step of PFMEA. 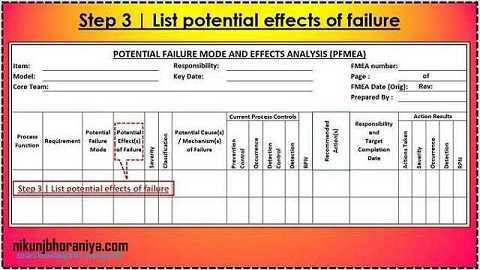 ➥ Determine the effects related to each failure mode. → Some failures will have an effect on the customers and others on the environment, the facility, and even the process itself. → The effect should be stated in meaningful terms. → If the effects are defined in general terms, it will be difficult to identify (and reduce) true potential risks. 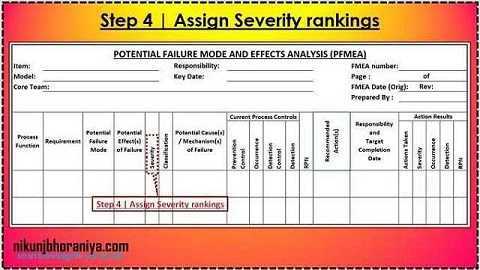 → Severity rankings are based on the severity of the consequences of failure in the 4th step of PFMEA (Process Failure Mode and Effects Analysis). ➥ Assign a severity ranking to each effect that has been identified. → The severity ranking is an estimate of how serious an effect would be should it occur. → To determine the severity, consider the impact the effect would have on the customer, on downstream operations, or on the employees operating the process. ➥The severity ranking is based on a relative scale ranging from 1 to 10. → Conversely, a severity ranking of “1” means the severity is extremely low. → Occurrence rankings are based on how frequently the cause of the failure is likely to occur in the 5th step of PFMEA. → Next, consider the potential cause or failure mechanism for each failure mode; then assign an occurrence ranking to each of those causes or failure mechanisms. ➦ If we know the cause, we can better identify how frequently a specific mode of failure will occur. How do you find the root cause? → One of the easiest to use is the 5-Whys technique. → Once the cause is known, capture data on the frequency of causes. → Sources of data may be scrap and rework reports, customer complaints, and equipment maintenance records. → There are many Problem-finding and Problem-solving methodologies. → Likes severity ranking, It is on a relative scale from 1 to 10. → An occurrence ranking of “10” means the failure mode occurrence is very high and happens all of the time. → “1” means the probability of occurrence is Very low. → Based on the chances the failure will be detected prior to the customer finding it in the 6th step of Process Failure Mode and Effects Analysis. → A Detection ranking of “1” means the chance of detecting a failure is certain. → Conversely, a “10” means there is absolute certainty of non-detection. → This basically means that there are no controls in place to prevent or detect. → RPN = Severity X Occurrence X Detection. → The higher the RPN, the higher the potential risk. → Define who will do what by when in the 8th step of PFMEA. → The RPN can be reduced by lowering any of the three rankings (severity, occurrence, or detection) individually or in combination with one another. → A reduction in the Severity ranking for a Process Failure Mode and Effects Analysis is often the most difficult. → Severity usually requires a physical modification to the process equipment or layout. → Reduction in the Occurrence ranking is accomplished by removing or controlling the potential causes. → Mistake-proofing tools are often used to reduce the frequency of occurrence. → A reduction in the Detection ranking can be accomplished by improving the process controls in place. → Adding process fail-safe shut-downs, alarm signals (sensors or SPC), and validation practices including work instructions, set-up procedures, calibration programs, and preventative maintenance is all detection ranking improvement approaches. ➥ What is considered an acceptable RPN? → The answer to that question depends on the organization. → For example, an organization may decide any RPN above a maximum target of 160 presents an unacceptable risk and must be reduced. → If so, then an action plan identifying who will do what by when is needed. 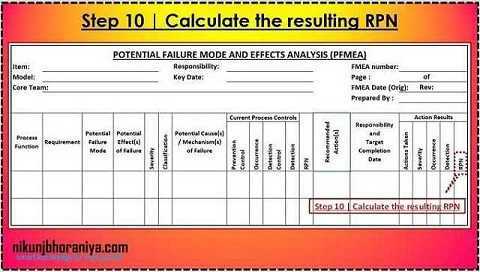 → There are many tools to aid the PFMEA (Potential Failure Mode Effects Analysis) team in reducing the relative risk of failure modes requiring action. → Mistake-Proofing (Poka Yoke) - "A Techniques that can make it impossible for a mistake to occur, reducing the Occurrence ranking to 1. Especially important when the Severity ranking is 10. → Statistical Process Control (SPC) - "A statistical tool that helps define the output of a process to determine the capability of the process against the specification and then to maintain control of the process in the future." → Design of Experiments (DOE) - "A family of powerful statistical improvement techniques that can identify the most critical variables in a process and the optimal settings for these variables." → The Action Plan outlines what steps are needed to implement the solution, who will do them, and when they will be completed. → While a complex solution needs more thorough planning and documentation. → Sometimes Project management tools such as PERT Charts and Gantt Charts will be needed to keep the Action Plan on track. → Responsibilities and target completion dates for specific actions to be taken are identified. ➦ Re-evaluate each of the potential failures once improvements have been made and determine the impact of the improvements. → This step in a Process Failure Mode and Effects Analysis confirms the action plan had the desired results by calculating the resulting RPN. → To recalculate the RPN, reassess the severity, occurrence, and detection ranking for the failure modes after the action plan has been completed. 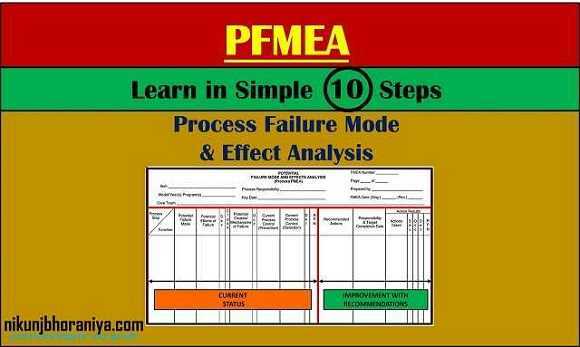 → Process FMEA identifies potential failure modes during a new product or process setups. → PFMEA assesses the potential customer effects of the failures. → The Process FMEA identifies potential manufacturing and/or assembly process causes. → It identifies significant process variables to focus controls for occurrence reduction and detection of failure conditions. 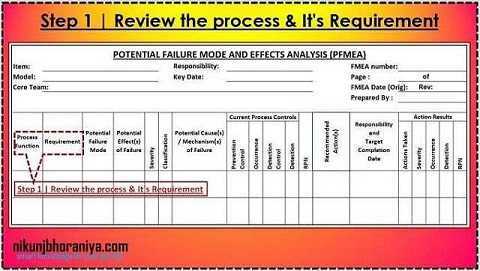 → Process FMEA develops a list of potential failure modes ranked according to their effect on the customer. → We can set a priority for corrective and preventive action for the potential failure modes with the help of PFMEA.